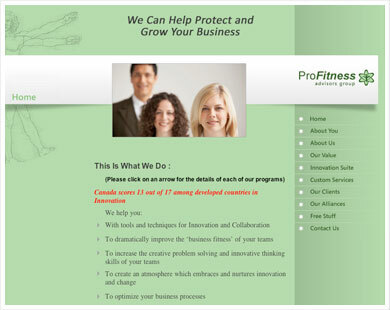 ProFitness Advisors Group aims to help organizations improve their business results using proven innovation techniques and collaborative consulting methods. They blend the analytic strength of their process re-engineering capabilities and technology consulting skills to bring about positive change in business including project management. Their innovation offerings include industry recognized training tools and proven techniques to deliver unique value and rapid results.